A.C. 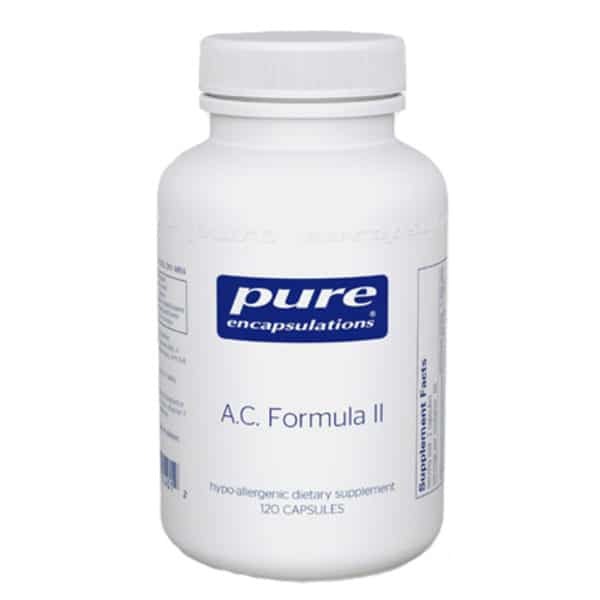 Formula II (120 caps) This synergistic combination of herbal extracts, caprylic acid and calcium undecylenate promotes a healthy environment for microflora in the colon and intestinal tract. Undecylenic acid and caprylic acid are fatty acids that promote a favorable environment for beneficial microflora. Calcium and magnesium act as buffers and may also help slow the dispersion and release of undecylenic acid and caprylic acid to support activity throughout the gastrointestinal tract. Grapefruit seed extract and berberine sulfate are highly concentrated fungal and microbial balancing extracts. Research suggests that they promote a healthy G.I. environment when exposed to a wide range of bacterial biotypes. Suggested Use: 2-6 capsules per day, in divided doses, just before meals with 6-8 oz. of water.